Sometimes people will still say to me, “Oh, you’re the fantasy job guy”, referencing my work creating career mentorship programs with VocationVacations. Luckily, the number of people who see me as Ricardo Montalban of careers are declining. Instead, people see the results of what career mentorship can accomplish: A successful transition to an ATTAINABLE dream career. Fantasies via Ricardo Montalblan’s Mr. Roarke are fantasies — they never truly come to fruition. Dreams, however, do. I work only with dreams. Examples of unrealistic “fantasy jobs” for most of us are NFL quarterback, brain surgeon or rock star. Examples of realistic “dream jobs” are bakery owner, stand-up comedian and fashion retailer. All that being said, I often hear people say that they have a career in mind to pursue but they’re too scared to pursue it. They see it as fantasy versus an attainable dream. One that stands out in my mind is being a sailor, working on a cruise ship or owning and/or operating a vessel touring company. There is a whole sector of folks who dream about sailing day-in and day-out but feel it’s simply too “fantasy”-based. They’re wrong. Whether you want to captain an ecological touring boat, be a schooner captain or sail the seven seas on a much larger commercial or leisure vessel, you CAN make your dream your reality. VocationVacations mentor, Cindy Adams, of the Reef Roamer and QuickSilver fleet in Key Largo, FL and I were recently chatting about it. She hears it all the time from people, “Oh, Cindy, you’re so LUCKY to be in this position.” As Cindy will tell you, luck has almost nothing to do with it. She and her husband, Terry, sought out a new career, leaving their corporate cubicles behind. They were not millionaires. They did not already own any land-based or boats in the Caribbean. Instead, it took planning. It took a business plan. It takes a lot of hard work. In the end, they have a wonderfully successful and lucrative business. They have realized their dream and have created a fantastic work/life balance for themselves. Only days after speaking with Cindy, I was in Hood River, Oregon which is situated right in the Columbia River Gorge along the Columbia River. Gorgeous spot. The Wadester and I are there all the time. We dream (and will make it happen!) of someday “bouncing” between living in Hood River with views of Mt. Hood and the Columbia, keeping the condo in Portland and having a small place in New York. Some day! Well, as I was admiring the most amazing rainbow across the river, I then spotted a “tall ship” docked. I had to check it out. 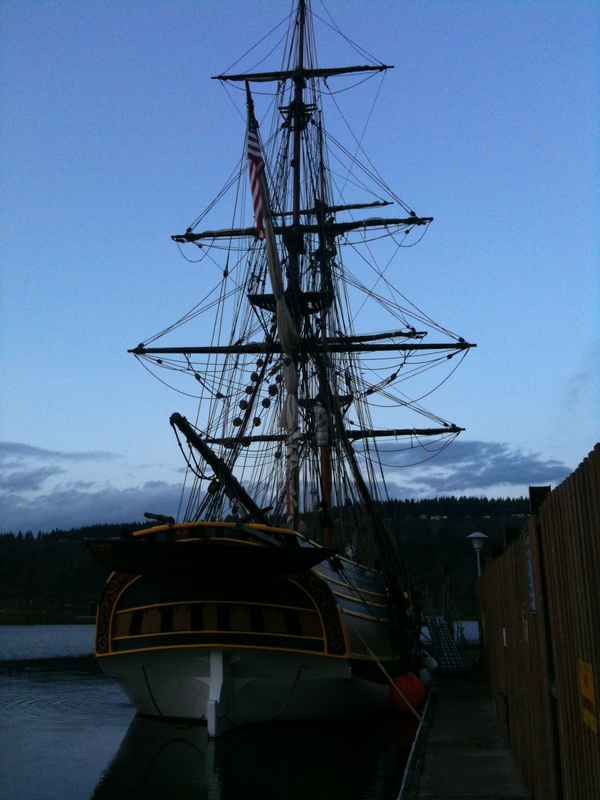 What was a tall ship doing in Hood River??? It was the LADY WASHINGTON, (owned and operated by Grays Harbor Historical Seaport in Grays Harbor, WA) a replica of the ship from the 1750’s that sailed around Cape Horn in South America and explored the west coast of North America. Amazing. And then I met someone as amazing as the ship: John Paul Clark. 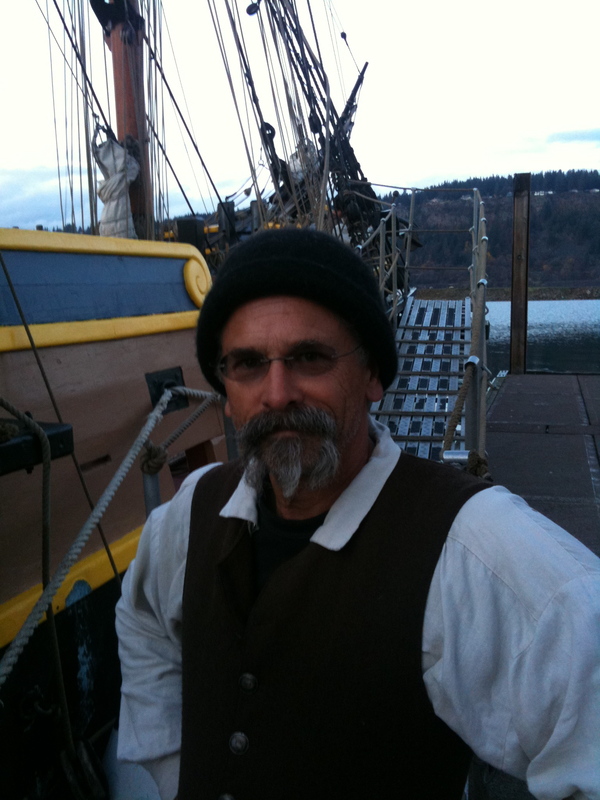 John Paul recently left his career as a carpenter to literally sail up and down the North American Pacific coast on the LADY WASHINGTON! I have to say that he is quite proud of himself. He chose the path. He went through months of training and is now living and working his dream on the water. He is not only part of the sailing team but is also responsible for providing the replica ship’s history to people like me. When I asked John Paul if he indeed found his dream job sailing up and down the west coast, he simply grinned from ear to ear and said, “Oh, yes, most indeed.” He also added that his daughter is proud of his endeavor of changing careers a bit later in life. John Paul is proof that it is NEVER too late to work in what you truly love. Now if sailing isn’t your thing, something else is. Culinary? Working with animals? Entertainment? Sports? Fashion? Whatever it is, do not assume that your dream is unattainable. It is not fantasy (unless you’re 45 and want to become that NFL quarterback). It IS attainable if you work through a career transition program and you are diligent about your own progress. I know. I have seen thousands of folks work through the process since 2004. Make your career dreams a reality. You can do it. Let the winds catch your sails! President of mentorship-based career consultancy, Brian Kurth + Company, and VocationVacations, providing 1-3 day career mentorship experiences to adults. Do you dream of working in the travel and hospitality industries? These are challenging times for both industries, but where there is a will and a plan, there is a way. Follow your passions and your dreams (and a decent living!) can come true. To encourage you and provide valuable advice and tips on how to break into jobs such as Tour Director, Travel Writer, Bed & Breakfast Owner, etc., we are thrilled to host a free teleclass on Thursday, May 28.